THIS 1.4 ACRE LOT WITH 100' OF CREEK FRONTAGE OFFERS DIRECT ACCESS TO VILAS COUNTY'S BRANDY LAKE WITH SMALL BOAT, KAYAK OR CANOE. QUIET NEIGHBORHOOD IN ARBOR VITAE LOCATED VERY NEAR SHOPPING, DINING, PARKS AND MEDICAL FACILITIES. VERY NEAR BRANDY LAKE PARK AND SWIMMING BEACH. 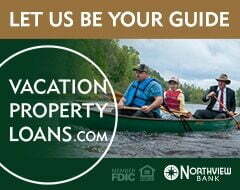 THIS WOULD MAKE AN IDEAL SPOT FOR YOUR FULL-TIME NORTHERN WISCONSIN RESIDENCE OR YOUR NORTHWOOD'S VACATION HOME AT A VERY AFFORDABLE PRICE. ALSO CONVENIENT TO AVW GRADE SCHOOL, SNOWMOBILING TRAILS AND MANY PAVED BIKE TRAILS. GET YOUR PLANS READY TO BUILD YOUR NEW DREAM HOME NOW!